HOTEL/CHEF NEWS . . . Led by the award-winning Milan-based Studio Marco Piva, the extensive architecture and interior design project marries contemporary aesthetics with the hotel�s original Belle Epoque architectural style. 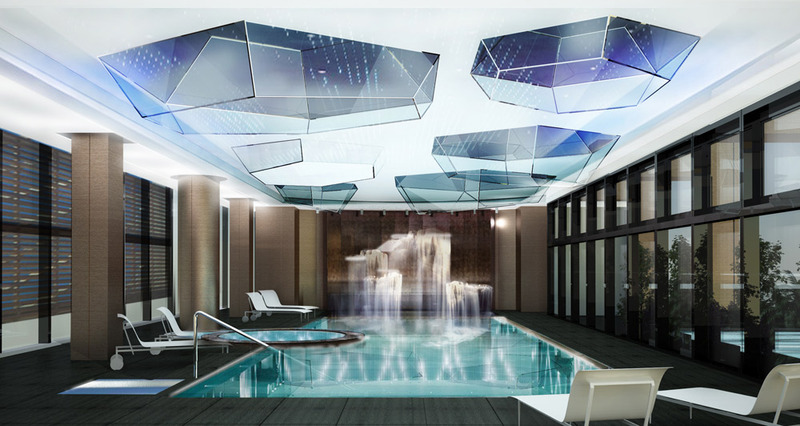 The Luxury Collection� Hotels & Resorts, part of Starwood Hotels & Resorts Worldwide, announces the official opening of Excelsior Hotel Gallia, a Luxury Collection Hotel, Milan. Owned by Katara Hospitality, this Milanese landmark recently emerged from a meticulous, all-encompassing renovation of the historic building, whilst adding a new contemporary wing. Formerly known as �Palace Gallia�, the hotel is strongly rooted in Milanese history, located in the heart of the new Porta Nuova district. 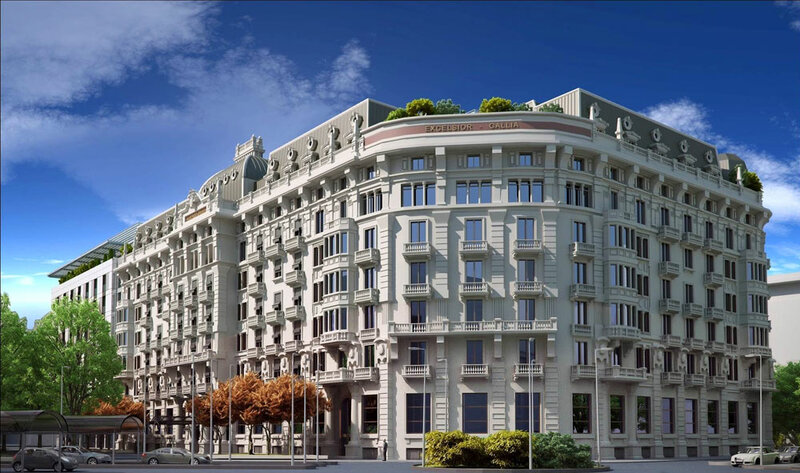 Excelsior Hotel Gallia is the latest gem to be unveiled by The Luxury Collection as part of a multi-million Euro investment to restore the brand�s most iconic European hotels. Led by the award-winning Milan-based Studio Marco Piva, the extensive architecture and interior design project marries contemporary aesthetics with the hotel�s original Belle �poque style. The renowned design firm also curated a unique collection of more than 500 pieces of art, including paintings, sculptures and photographs. The interiors feature distinct references to Milanese lifestyle and the timeless elegance of the Art Deco era, including furnishings exclusively created by Italian designers and craftsmen. Excelsior Hotel Gallia comprises two buildings � the fully restored historic palace and a new modern wing with a fa�ade that resembles a delicate steel and glass curtain. The striking juxtaposition is inspired by the hotel�s luminous past and the emerging skyline of the Porta Nuova area. Guests entering the hotel are welcomed by the dazzling sight of a custom-made 30-metre Murano glass chandelier created by De Majo, depicting a waterfall of 180 light cylinders which illuminates the eight-story monumental stairwell. The historical lobby pays tribute to notable Milanese architecture of the 1930s, such as La Scala Theatre, Vittorio Emanuele Gallery and Villa Necchi Campiglio. The public spaces have been outfitted by B&B Italia using aluminium, glass and marble. 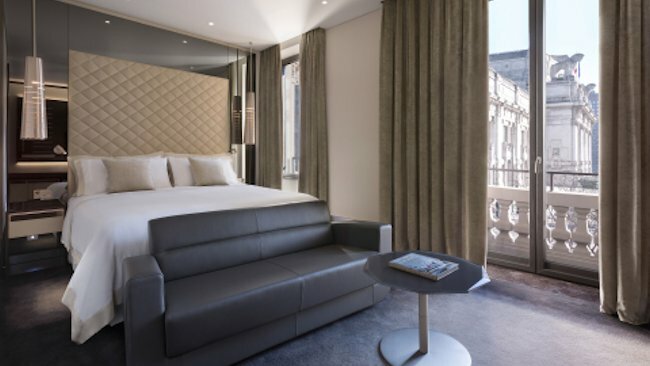 Excelsior Hotel Gallia features 235 luxurious guest rooms, including 53 suites. The 1,000sqm Katara Suite � one of the largest Presidential Suites in Italy � is situated on the seventh floor, offering two terraces, four bedrooms and a private spa. The two-bedroom Gallia Suite mimics a sophisticated private residence with its beautiful loggia surrounded by historical columns and statues. The other 51 suites revolve around five distinct themes: Design Suites, dedicated to a renowned Milanese designer or architect, namely Vico Magistretti, Achille Castiglioni, Gi� Ponti, Luigi Caccia Dominioni and Franco Albini; Art Suites, which overlook the square and feature a large sliding panel with photos of the hotel�s historic fa�ade; and Atelier Suites, evoking the ambiance of creative workshops. The hotel�s Signature Suites have been conceived as art galleries with theatrical use of lighting, colour, and artwork, while the Executive Suites are inspired by the elegant atmosphere of Milanese lofts. All the rooms are outfitted by Cassina Contract with the exception of the Katara Suite which has been furnished by B&B Italia. Set to open in September on the seventh floor, the hotel�s roof-top mixologist bar and signature restaurant Terrazza Gallia will be managed with the advice of the renowned Cerea family. With the three Michelin-star duo Enrico and Roberto Cerea providing culinary guidance on Terrazza Gallia, diners can savour the best of traditional Italian and Lombard cuisine with a contemporary twist. Guests seated on the covered and heated outdoor terrace will enjoy a panoramic view of Milan, including the landmark Central Station and the adjacent Pirelli skyscraper by Gi� Ponti. The Cerea family will also lend their gastronomic expertise to the hotel�s banqueting and events services. The Gallia Restaurant on the ground floor offers the ideal location for a breakfast meeting, smart business lunch, or private dinner, whilst the Wine Cellar is the ideal setting for an intimate private lunch or dinner. 1.25 ounces Fernet Branca, 1.5 ounces Aperol, 1 ounce Drambuie, 1/2 ounce Tequila. Add a twist of orange to garnish and savor the signature Gallia cocktail. Featuring the first Shiseido Spa in Italy, guests can enjoy treatments at Shiseido Spa Milan, the largest hotel spa in Milan, spanning over 1,000sqm. Located on the sixth and seventh floors of the hotel, the spa provides a relaxing and tranquil ambiance with natural daylight, offering a wide range of beauty and wellness rituals as well as a swimming pool and fitness area with the latest equipment from Artis by Technogym. The hotel�s historical Cupola room on the seventh floor houses a modern, multifunctional space equipped with the latest audio-visual technology, making it a spectacular and unique venue for celebrations and events. Connecting the historical centre of the hotel with the main hall of the new building is the indoor �Promenade�, a charming 100-metre walkway with large boutique windows from the fashionable Montenapoleone Street. The ground floor of the new wing features 12 meeting rooms, spanning across 1000sqm, as well as 700sqm of foyer space. For more information about Excelsior Hotel Gallia, visit www.luxurycollection.com/excelsiorgallia.